my little sister gets hitched! Anita and Wes getting married. 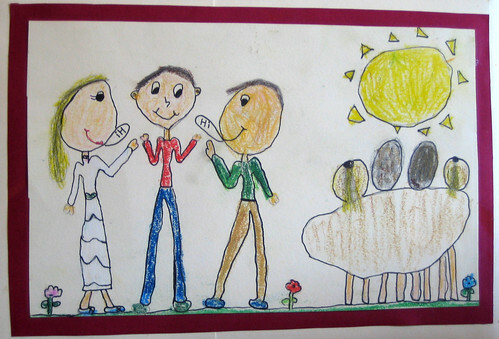 Drawing by Payton Vibe, age 7. Last week, I (Leanne) had a wonderful trip to Canada. The main reason for my journey was to attend my little sister Anita's wedding. Another big plus of the trip was that I got to see my family and friends -a thing that doesn't happend very often for us especially while we've been living in Japan. Taking 10 days off from work was a really big deal. Unfortunatly it was absolutely impossible for Rik and I to both attend the wedding. So, for the first time in the 6 years since we were married, we were apart. We both survived, but concluded that being together is better! My sister lives in Nakusp, which is a small town of only 1800 people. 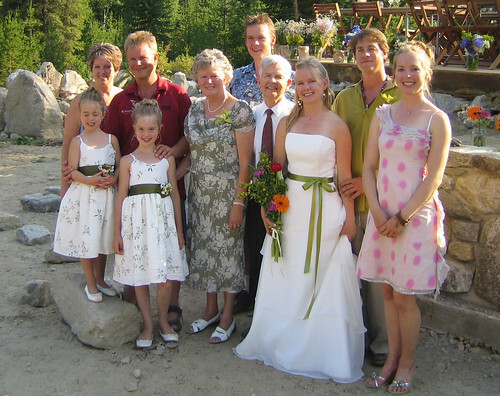 Set in the mountains on a lake, Nakusp is a gorgeous place to live. Swimming in the crystal clean snow fed lake was an invigorating experience. Diving down deep with my eyes wide open I almost felt like I had entered a new universe. Anita and Wes also have 2 great dogs- Piper and Oden. It's so great to be outdoors with active and friendly dogs. 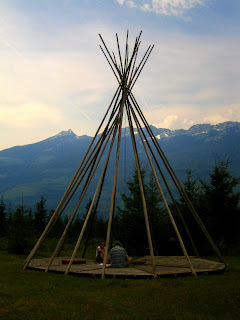 The ten days I spent in Nakusp went by like a whirlwind. Most days were full of preparations for the wedding. A 3 day wedding, all self catered is a lot of work. We made so much delicious food including appropriate food for vegetarians, carnivors, children etc. The menu was so varied that I think everyone enjoyed themselves. The day of the wedding was of course hot and clear (everyday was hot and clear). In the morning we drove to a little town called New Denver and most of the women involved with the wedding participated in a yoga class. This was exactly what we all needed after all the week long preparations and pre-wedding jitters. At the end of the yoga session I think more than half of us fell asleep in the final resting pose. The wedding ceremony was perfect- the bride and the groom were relaxed and happy. The food was delicious, especially the grilled wild salmon. 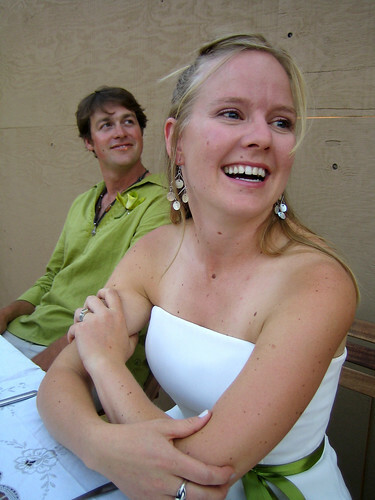 The organic wine and locally brewed kegs of beer helped to enrich the party. After dinner there was an awesome live band that played for hours. I was so impressed with the enthusiasm of the band. I think EVERYONE in attendance at the wedding danced. The energy of the band was catching and we were all pulled into the driving rhythm of the music. 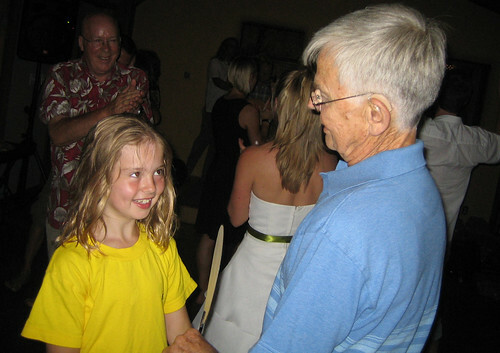 Here is a picture of farfar Vibe (farfar means father's father in Danish) dancing with his granddaughter Morgan. When the band finished, so did the party. Almost immediately everyone retired exhausted to their tents and accomodations. Anita and Wes make such a lovely couple. I was thrilled to have been able to share in this celebration of love with them and our families and friends. We like to think ourselves reasonably adaptable, though there are a few things in Japan we’ll probably never come to peace with. One of them is the rampant superstition that thoroughly pervades and degrades nearly every part of society, be it as a propensity for gambling, letting fortune tellers control one’s life, etc, etc. To each his/her own, we suppose, go ahead and ruin yourself. 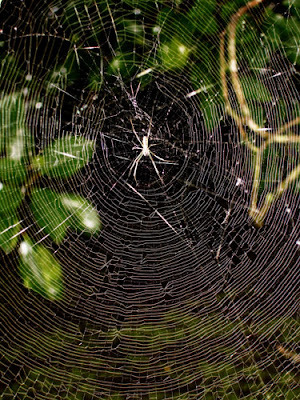 But we are rubbed the wrong way by the mistreatment of other living things. Probably imported from China a very long time ago, logic such as: a viper is long and thick, its venom potent; kill it, dry it, powder it, consume it, and the erstwhile qualities will somehow be transferred to your own trouser snake. Or, medieval 'wisdom' like: a turtle lives a long life, and an eel’s body is long, so for your own longevity devour either. This superstition may also contribute to what feels like (to a Westerner anyway) a pervasive lack of respect for living things. Snakes, turtles, eels and other slimy wild creatures are hunted down, but they are totally unimportant compared to the fish populations around Japan, all but depleted by headlong overfishing with not even a distant hope of regulation. Livestock are penned up in body size stalls for their entire lives (Japanese steaks go for $70, prized for their 'softness' since the animal was deprived of any significant movement while alive). Hokkaido milk cows, although free roaming, don't have it much better: their tails, viewed as a nuisance while milking, are tourniqueted till they 'naturally' fall off. In an odd lack of discrimination from animals, humans too are worked like slaves, many finally keeling over from chronic injury or overwork, if they don't first end their miserable lives in suicide. Attitudes towards other nationalities are wholly unacceptable, and politicians see no reason to apologize internationally for 60-year-old war heinosities; prime ministers worship enshrined war criminals, and the populace is frustrated and confused by why neighboring countries won't stop nagging. Like I say, we’re not animal or human rights activists or anything…this nonsense just seems hard to get used to. 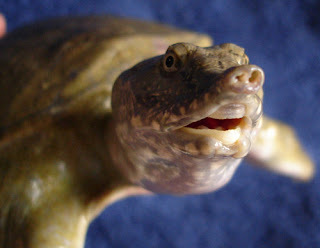 Our one Canadian colleague at work shared this sentiment, it seems, when three suppon (softshell turtles, Pelodiscus sinensis) appeared at the local general store. As it became obvious to her they are to be eaten and their blood drunk or whatever, she became distressed, and when I told her I know just the perfect place to release them, she proceeded to bail them out (at about $40 for the lot). Three very lucky suppon were soon swimming around in my bathtub. Avid readers of our blog (ha!) will remember Salvage Part I when we saved Bambi at the Goto Islands. There, too, the comment from the locals was, should’ve clubbed it over the head when you had the chance. So we’re not even gonna attempt to explain this suppon thing to any of the natives. 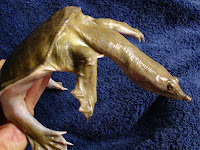 A suppon is really a pretty interesting creature, not to mention it's so ugly that it's cute. 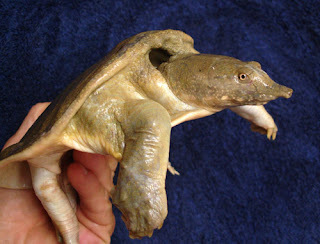 Its soft, flat shell gives it a low profile and this combined with its webbed feet makes it a great swimmer. It compensates for its soft vulnerability with razor sharp “teeth” and an ornery temperament. 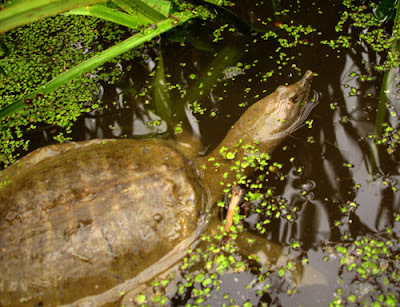 Like the Canadian snapping turtle, the suppon, although much smaller, is still quite dangerous. Its neck can pop out incredibly far (is this why it’s sought after?) and can shoot out and catch a fish or deliver a nasty bite “before lightning strikes the ground” as the local saying goes. It is also an expert in burrowing in the mud. With only the top of its camouflaged head protruding, it waits for prey. Occasionally, telescoping its long neck slowly, it uses its supple, pig-like snout or mini-trunk to take a breath without making the slightest disturbance of the water surface, giving no warning of its presence to surface-dwelling insect prey. After a two-day stay in the tub, the three suppons took a little trip with me to an undisclosed location where they will be safe from its main predator. Suppons are usually caught in polluted rivers or ponds, and they are starved for who knows how long to purge them of ‘impurities’ before they are eaten (as if that was going to help), so it was no surprise my traveling companions were quite dejected and exhausted. 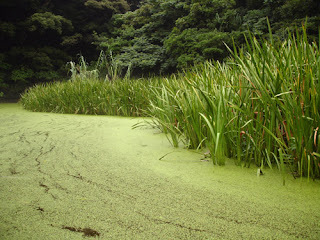 But upon immersion in pure, clean pond water (this place is as far from pollution as one can get in Amakusa anyway), the poor buggers suddenly came alive. On release, they immediately buried themselves in the soft deep mud, a tactic that seems to serve them better than trying to escape. 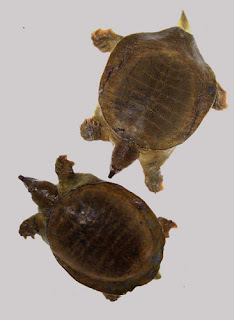 Here’s hoping to three properly long turtle lives! A suppon in its natural environment. 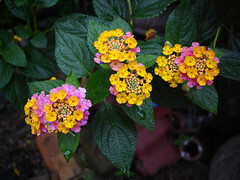 It’s been very wet and humid in Amakusa this past month – a somewhat belated rainy season. People are complaining but it’s not bugging me any. At least there won’t be announcements on the town bomb raid system that the dam is low on water 3 times a day, two months in a row, like happened 2 years ago. Somehow that drove me bonkers. Anyways, our water lily ‘pond’ by our front door likes the rain. Over time it’s been a mini ecosystem for sundry temporary dwellers: a large brown grasshopper overwintered on the dry reeds, not moving at all for 3 months. One hint of spring and he was gone. Later the water teemed with dragonfly larvae, which soon pupated and flew away. 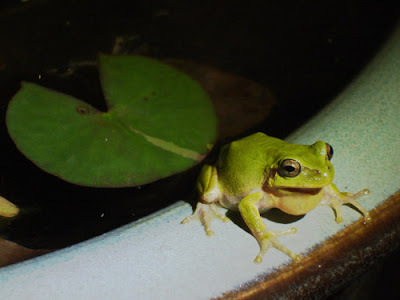 And a week ago, the pond was discovered by this tiny tree frog (about an inch long). Figuring he's found an A-1 breeding spot, he’s trying very hard every night to attract a mate. His croaking must be at least 80 decibels; it’s incredible how such a tiny thing can make so much noise. Our neighbors hate him, I’m sure – people here think even songbirds are noisy! Not the bomb raid system, though, nor the police helicopters that circle overhead with a PA that actually blares over the rotor noise, reminding the neighborhood to fasten your seatbelt should you go out for a drive. Tate hamlet, Monday, July 2nd, 5a.m. The sun hasn’t yet risen, but an obnoxiously long electronic tune comes blaring over the rooftops from the ubiquitous public announcement speakers. We’re here at this ungodly hour to catch the tide. Nothing stirs in the village as the tune finally comes to an end. Peasants awake, it’s time to work! Yet another bizarre way the country’s ancient customs have intertwined themselves with modern technology. Certainly, the term ‘noise pollution’ is utterly beyond understanding in Japan. Soon we are on the water. This weekend’s 72km tour, thought of as mild training for our upcoming summer vacation in Okinawa, will take us around the island of Nagashima to the tiny island of Katsura-jima, the smallest inhabited island in these parts. 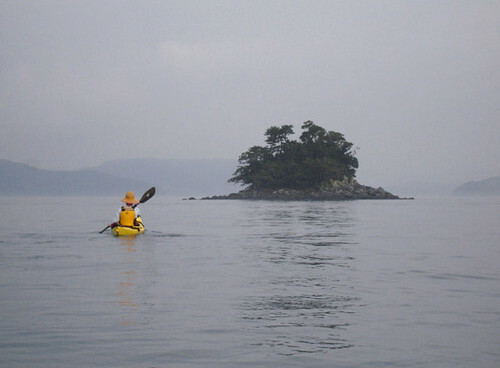 While we’ve paddled these waters a-plenty, we’ve never visited Katsura-jima before, because it lies somewhat out of the way to the east of our usual paddling routes. Internet searches about this island were sketchy, and we know only that 25 people live there and there is no ferry or facilities of any kind, in spite of which mainlanders seem to come camping occasionally in the summer. From our experience however, this kind of incomplete and conflicting information usually indicates a quality destination, so we set out today with some anticipation and excitement. 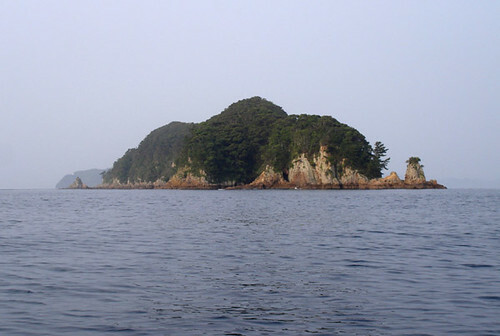 We make a brief stop on Aka-shima, a small sliver of an island wedged diagonally in the narrowest part of the Nagashima Strait. At spring tide, the sea roars past here at 6 knots or more, and the ends of the island shed some mean eddy lines – lately we have been using these to practice various maneuvers. Today, the tide is milder and we take an early break here in the morning sunshine. 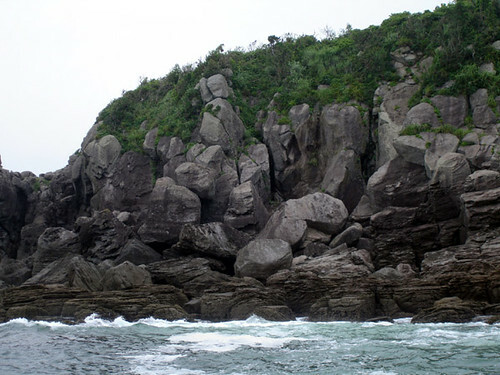 I climb a short ways up the steep slope to the islet’s spine, where the undisturbed nature is a pleasure to look at. Soon we are off again. From here we head south to where the strait opens out into the East China Sea. Some swell is rolling in from the south while the outgoing currents swirl in complex ways. Without detailed knowledge, using the currents to one’s advantage is difficult and today we take measurements on the way, in an effort to form a coherent picture of the water’s movements. After another rest in a nondescript concrete port, we pass the southernmost point of Naga-shima. Here, a small rocky island called Tatara-jima is battered by the swell concentrated around the headland. Carefully navigating around the booming shoals, we enter the Kuronoseto, a narrow passage leading back into the Yatsushiro bay. The tide has turned in the meanwhile and we enjoy a tail current all the way to Katsura-jima, where we arrive in the early afternoon. As we pull up in the tiny old port, we see that this place is as backwater as can be. 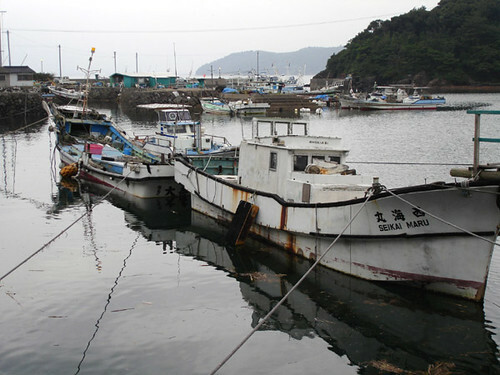 Half-sunken boats await complete decomposition along with rotting ropes and nets. On shore, the same might be said of a good portion of the houses. Amongst this decay, however, a few houses remain in a decent state of repair, with narrow paths cleared for access through the junk and weeds. Where the paths get steep the locals have set up boards with transverse slats to walk on – on the moldy, damp concrete underneath one would surely slip. There is even a school here, but it seems deserted on what ought to be a school day. The whole place seems about the right size for its population of 25 – that is, tiny. 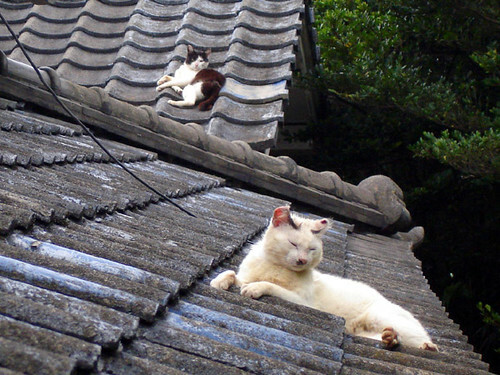 Cats are everywhere, outnumbering the human population by a factor of at least five or ten. 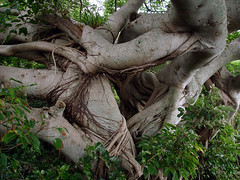 Banyan trees line the coast in the village. Outside the cluster of houses, the rest of the island is an impassable jungle, although concrete walls connect it with two more islets where a path affords a remarkably pleasant walk amongst some beautiful tall pine trees. 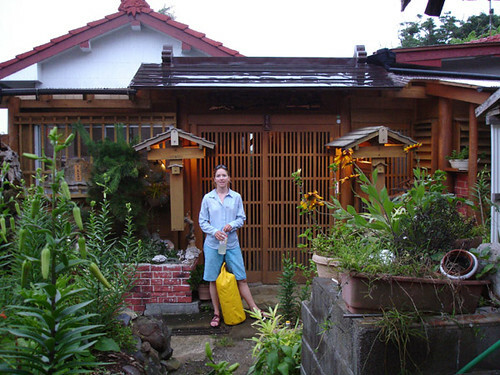 Our private cottage on Katsura island. Needless to say, it takes no time before we are noticed by the local residents, who express some interest in our kayaks. With no one in a hurry in a place like this, we are engaged in long friendly conversations about nothing in particular. A hospitable fisherman and his wife soon show their generosity by putting us up in a luxuriant house that the man has built ‘as a hobby’, decorating it with much pine wood from local trees downed by typhoons. 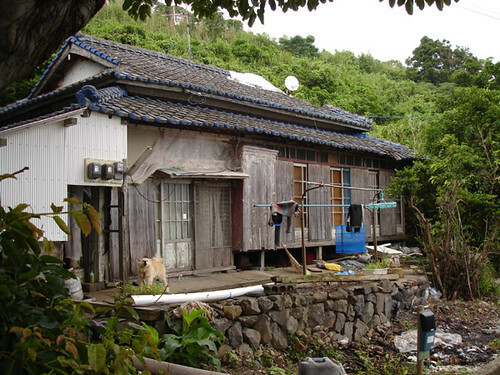 It’s a kind of guest house, they say, where they welcome any visitors to the island; they don’t charge any money. Anyway, they say, it’s much better than camping, as there are many mosquitoes. At this point, we’re not sure what to believe, but we graciously accept to stay and take a shower to wash off the sticky salt and sweat off our bodies (the island has electricity and water provided by cables and pipes from the mainland). By evening, having explored everywhere one can walk, we retire to our house just as heavy rain showers pour down. We read books and magazines until it’s time for bed; we sleep like rocks through the dark, rainy night. Before seven the next morning, the rain and wind have stopped and we are already making preparations for our return trip. We have a tide to catch and have to be at work from three in the afternoon. Our fisherman host is already (or still) up, having worked through the night, and two women stack nets in their small boat, getting ready to go out. We say goodbye to these friendly, relaxed, commonsense people and promise we will someday return. The way back is a nearly straight line, much of it crossing open water. 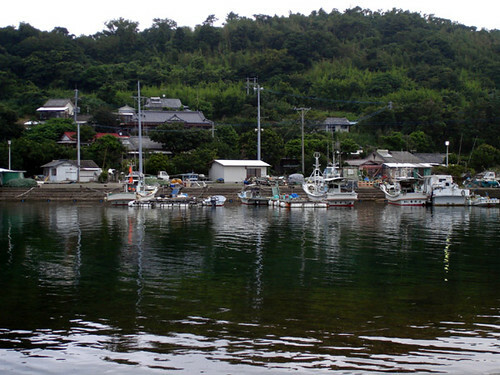 Along the way we enjoy the sight of several tiny islands such as Nanao-jima. Islands such as this, really just rocks big enough to support a few trees and some brush, are remarkably common in Amakusa. 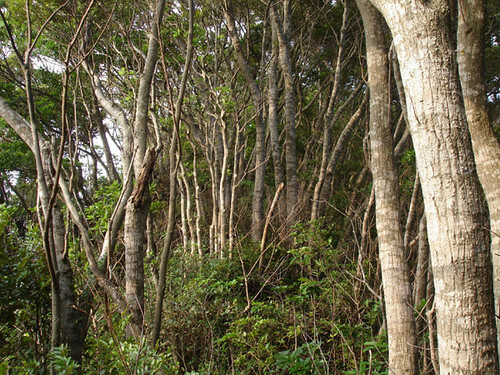 The twisted trees clinging to the rocks give the impression of a full-size bonsai garden. Mist thickens into a fog-like consistency towards noon and we are on a state of alert as we make the crossing of Hachiman Strait, a fairly busy shipping channel. A foghorn sounds repeatedly from the south, and finaly an enormous Panamanian freighter emerges from the mist on our left. Although we know we are already out of its way, its sheer bulk and the huge bulge of water being pushed ahead of its prow seem intimidating; we feel a tug from our primal instinct to flee. But we hold still and watch it pass. We notice how a kind of fisheye lens perspective effect makes the behemoth look like it’s turning or bending as it passes us. It draws away quickly and disappears again into the mist while we paddle towards shore to resume, for a while, our ordinary lives.